The demand for a $15 minimum wage continues to surge forward as a concrete answer to one of the central issues driving U.S. politics – income inequality. 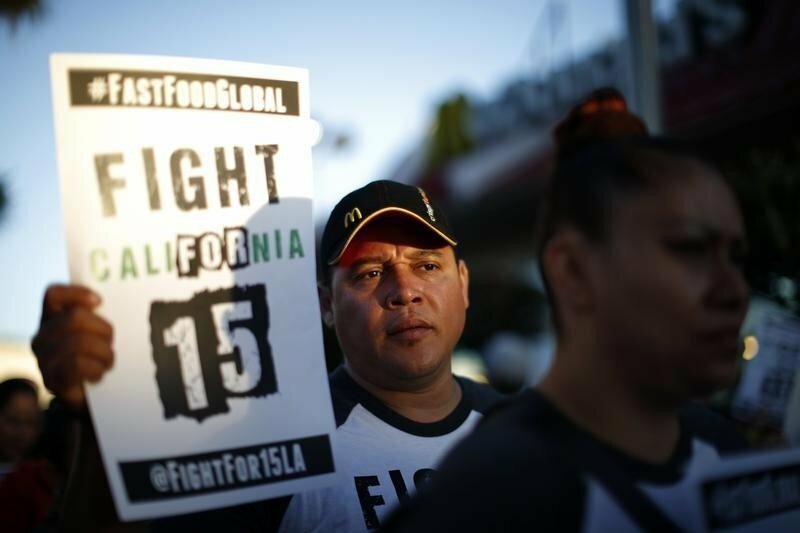 Not only has Los Angeles joined Seattle and San Francisco in passing $15 an hour ordinances, but politician in other cities like St Louis, New York City and Philadelphia are starting to feel the ground moving under their feet. Already, polls show 63% of the public supporting a $15 minimum wage. 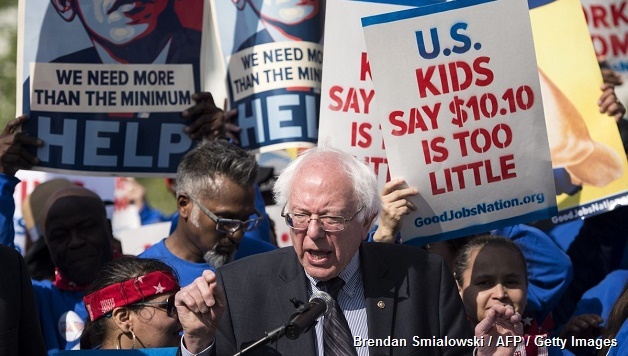 With Bernie Sanders, embracing $15 an hour, it can surge even more in coming months. Leading Democrats have started to realize that the minimum wage issue could be central to keeping control of the White House and regaining control of the Senate. Bernie Sanders’ bold campaign is further exposing divisions within the Democrats. Facing a major challenge to their left, the Clinton campaign is attempting to play “catch up” with sharper rhetoric about income inequality, while at the same time reassuring her Wall Street backers that she can be relied upon to defend their interests. She recently called into the Fight for 15 Conference stating she wanted to be the fast food workers’ “champion”, without committing to any figure for a minimum wage. With the April 15 nationwide day of action by fast food workers the largest and most dynamic yet, pressure continues to build. A group of 18 Senators, led by Bernie Sanders and Elizabeth Warren, has demanded that Obama write an executive order lifting pay to $15 an hour for federal workers. Considering that Obama was talking about $10.10 only 18 months ago, this demonstrates the effect our movement is having. There are enormous opportunities to push for a $15 an hour minimum wage in the coming months, particularly at local and state level. On the one hand, we need to continue organizing and protesting in the streets. 15 Now, launched by Socialist Alternative in Seattle, is playing a key role in a number of cities alongside a number of unions which are putting in real resources. On the other hand, we need independent working class political candidates who can raise the issue in the public arena. While Sanders is helping pushing forward the $15 demand, we need to be clear that the corporate leadership of the Democratic Party is mainly interested in using the minimum wage issue to get back into power. It will take running candidates independent of the Democratic Party, like Kshama Sawant, Seattle’s socialist councilmember, who has combined movement building with implacable opposition to the corporate agenda, to achieve the kind of gains we need. This is why we have urged Sanders to keep his campaign and its call for a federal $15 minimum wage going irrespective of who the Democratic Party nominates as its candidate. Previous article$15 Wins in Los Angeles – St Louis Next?